DIEGO MARADONA has declared “I am fine” after fears were raised for his health following Argentina’s win against Nigeria at the World Cup. The 57-year-old was filmed looking unsteady on his feet and being helped away from his seat after the match, while Argentinian newspaper Clarin published pictures of him being attended to by medical staff. A number of earlier reports had claimed Maradona had been taken to hospital – but the retired player quashed the rumours in an Instagram post several hours later. Revealing he had suffered neck pain during half-time, Maradona said he had seen a doctor and was advised to go home before the end of the game but decided against it. He said: “I want to tell everyone that I am fine, that I am not, neither was I interned. The post was accompanied by a picture of the former footballing star with a medic. Following the game, Maradona, who drove Argentina to glory at Mexico ’86, had been pictured looking in far better health by Patricia Villegas, president of Latin American broadcaster teleSUR. She reported Maradona had boarded a flight to Moscow, sharing a picture of him on what looked to be a luxury jet. 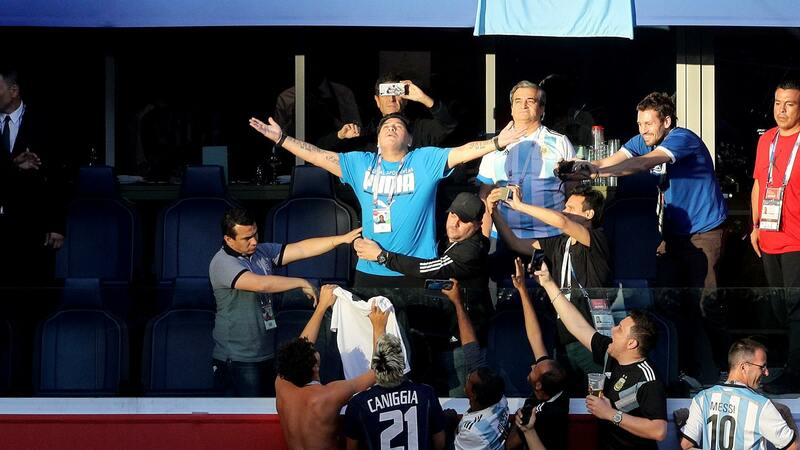 The health fears came amid criticism for Maradona over his crude celebration of Argentina’s winner against Nigeria. Seconds after Marcos Rojo’s 86th-minute strike hit the back of Nigeria’s net, television cameras showed Maradona thrust middle-finger gestures with both hands. At the finals in Russia, Maradona has been a notable presence at all of his country’s matches, watching from the stands. And when Rojo cracked in Argentina’s second goal in a hard-fought 2-1 victory in St Petersburg that carried the team through to the last 16, he held nothing back. Swinging his arms exuberantly, he also appeared to shout out an insult before cameras turned away from the former Barcelona and Napoli player, who has had a number of personal problems since his playing days. BBC sports presenter Dan Walker wrote on Twitter: “And that’s why you don’t show Maradona no matter how good he was in his prime”.